Medium: original lithograph. Executed by Palazuelo for Derriere le Miroir in 1955. Not signed. Sheet size: 14 3/4 x 29 1/2 inches; with text on verso and two center folds, as published. Medium: original lithograph. Executed by Palazuelo for Derrière le Miroir (issue 184) in 1970. Sheet size: 15 x 33 inches (380 x 842mm); with two center folds, as published. Not signed. Condition: there are minor handling creases. Medium: original serigraph. Executed in 1982 for what was planned to have been the very last issue of Derriere le Miroir (issue No. 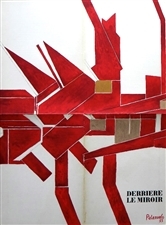 250), and published in Paris by the Maeght atelier. Many of the artists who had been regular contributors to DLM throughout its more than thirty years of publication, contributed original prints for this project. Among these were Chagall, Miro, Kelly, Chillida, Palazuelo, Garache, Adami, Fiedler, Ubac, Pol Bury, Alechinsky, Tal-Coat, Riopelle, Tapies, Bram van Velde and several others. Sheet size: 15 x 11 inches (380 x 275mm). There is text on verso, as issued. Signed in the plate, not by hand. Condition: there is wear (scratches and scuffs) to the surface. Medium: original lithograph. 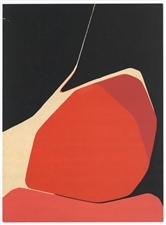 This large lithograph was executed by Palazuelo for the cover of Derriere le Miroir in 1955 (issue 73). Sheet size: 30 x 22 inches (760 x 555mm); with text printed on the back and several center folds, as published. Signed in the plate, not hand-signed. Condition: this was the actual cover -- there is wear and some stains. Medium: original lithograph. Executed by Palazuelo for Derriere le Miroir (issue 184) in 1970. Sheet size: 15 x 10 3/4 inches (sheet slightly trimmed); with text on verso, as published. Not signed. Medium: original lithograph. Executed for the "Poetes, Peintres, Sculpteurs" issue of Derriere le Miroir (No. 119) in 1960. Sheet size: 15 x 11 inches (374 x 278 mm). There is text on verso, as issued. Not signed. Condition: there is a tear near the top left.